Utility maximisation refers to the concept that individuals and firms seek to get the highest satisfaction from their economic decisions. For example, when deciding how to spend a fixed some, individuals will purchase the combination of goods/services that give the most satisfaction. Utility maximisation can also refer to other decisions – for example, the optimal number of hours for labour to supply their labour. Working more increases income, but reduces leisure time. Utility maximisation is an important concept in classical economics. It developed from the utilitarian philosophers of Jeremy Bentham and John Stuart Mill. Early economists such as Alfred Marshall incorporated utility maximisation into economic theory. An important assumption of classical economics is that the price consumers are willing to pay is a good approximation to the utility that they get from the good. If people are willing to pay £800 for an iPhone X, then this suggests the consumer must get a utility of at least £800. Economists such as Carl Menger, William Stanley Jevons and Marie-Esprit-Léon Walras. And Alfred Marshall developed ideas such as diminishing marginal utility. 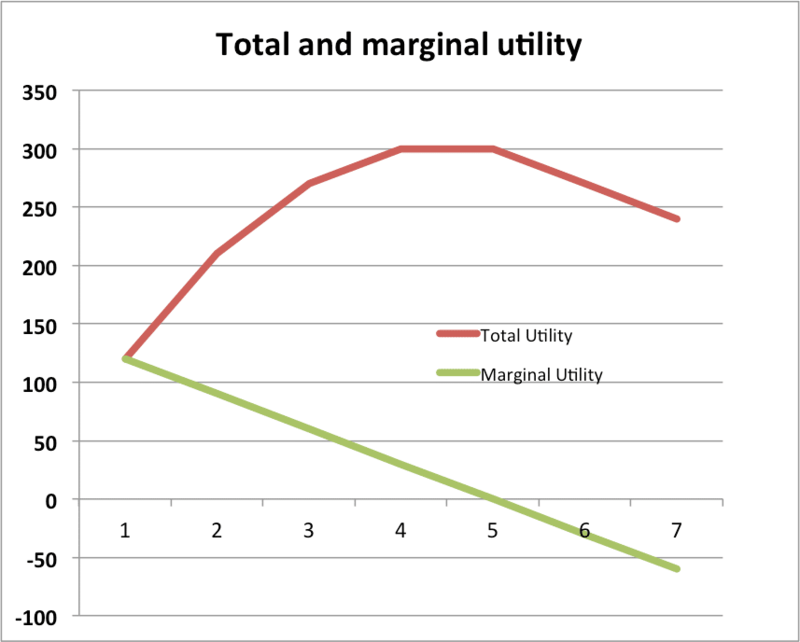 The idea that after a certain point, extra quantities of a good lead to a decline in the marginal utility. (For example – The first car gives high utility, but the utility of a second is much lower. 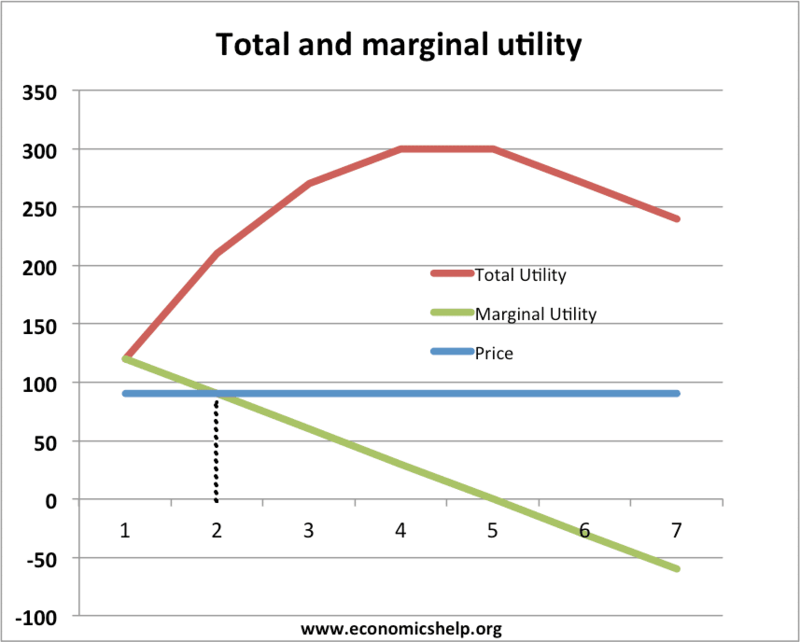 Marginal utility shapes an individual demand curve, as the utility from extra units declines, consumers are willing to pay a lower price – hence a downwardly sloping demand curve. 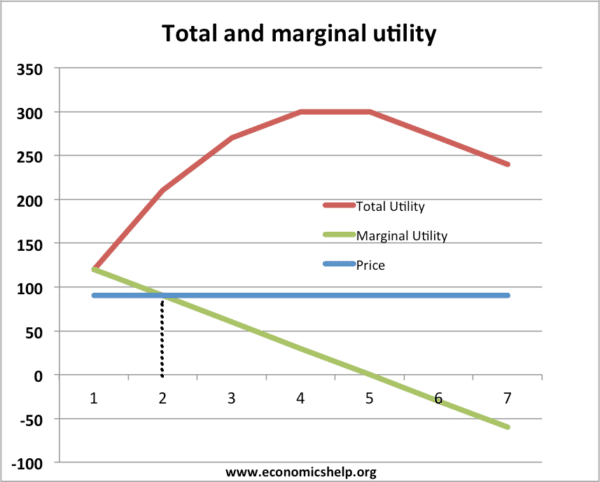 A consumer will consume a good up to the point where the marginal utility is greater than or equal to the price. In this example, the optimal consumption of units is 2. A third one gives you a utility equal to 50p – but this is less than the price. 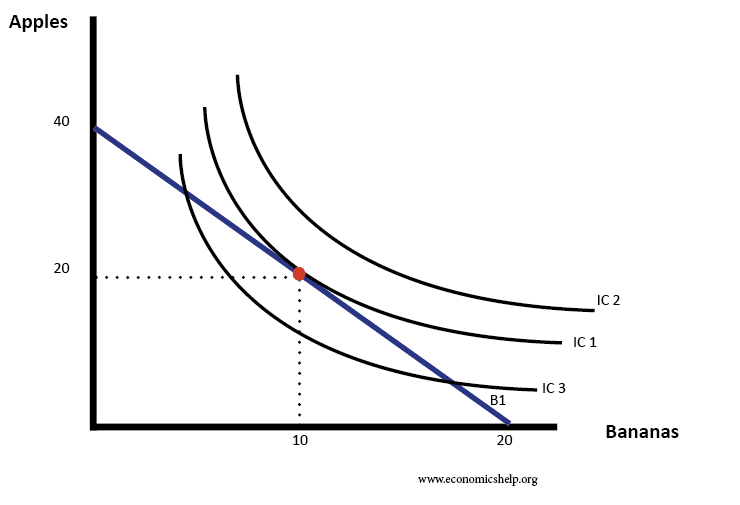 Indifference curves show different combinations of goods which gave the same utility. Indifference curves further to the right are more desirable as they have bigger combinations of goods. Utility will be maximised at the furthest indifference curve still affordable. Ordinal utility. 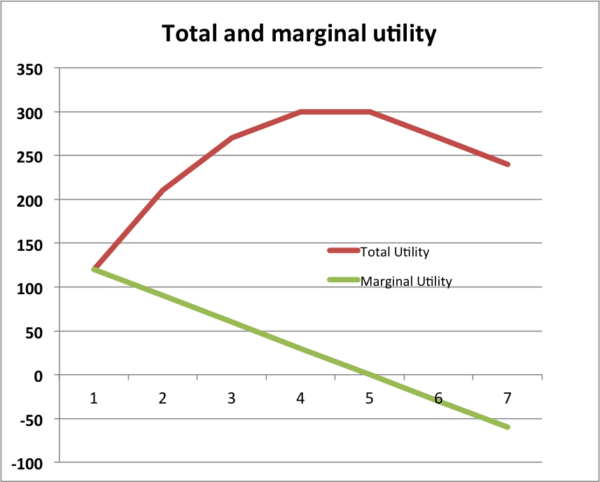 Ordinal utility states consumers find it hard to give exact values of utility, but they can order by preference – e.g. I prefer apples to bananas. This theory of ordinal utility was developed by John Hicks and gives less precise but rough guides to utility of consumers. Impulsive behaviour – buying goods which are later regretted. Loyalty, e.g. loyalty to local shops rather than buy cheaper from supermarkets. Sense of morality, e.g. not drinking alcohol.